The program will be held during the day in Box Hill and is tailored for adults with disability to enhance their independent living skills. 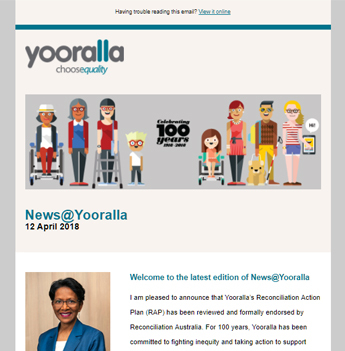 Yooralla is launching a new Life Skills program in a home setting in inner eastern Melbourne, to enable people with disability to gain independent living skills. The program will be held during the day in Yooralla’s Respite Service for adults in Box Hill; this means that participants can apply the skills they learn as if they were in their own home. This program is tailored for people with disability who are looking to enhance their independent living skills if they are living at home with family/carers, or are in shared accommodation and looking to move out and live independently. It will also be offered to people staying at the Respite facility as an additional benefit of staying in the short term accommodation facility. Yooralla’s Life Skills program builds on similar programs already offered through Yooralla’s Community Hubs, with the key difference being that participants can apply their skills in a home situation. Funded under the NDIS as a capacity building support, the program aligns perfectly with people’s goals relating to building living skills, gaining confidence and independence. Depending on the participants’ goals and needs the program can include developing and following a budget and money skills, household care, laundry and clothes care, preparing a healthy weekly menu, shopping for groceries, cooking and healthy eating, hygiene and personal care. The program would be held on Mondays, Tuesdays and Wednesdays from 9am to 2pm. If you would like more information about this program you can contact Yooralla’s Community Engagement Team on 03 9666 4500 or email ndis.infohub@yooralla.com.au.